Whomp whomp. There're no Mindwipes for sale. 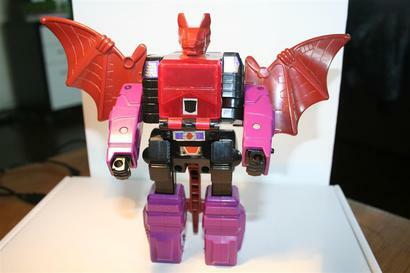 One of the more beloved of the Headmaster toys due to his creepy bat mode and garish colors. I really did like this one, very, very cool looking, I love the unique transformation from cool looking bat to robot. The only thing I don't like is that the tabs on his arms for his fists are way to fragile.